Montreal, January 21, 2019 – Quebec Precious Metals Corporation (TSX.V: CJC, FSE: YXEN, OTC-BB: CJCFF) (“QPM” or the “Company”) is pleased to report results for the five drill holes completed in late 2018 on the 100%-owned flagship Sakami Project, located in Eeyou Istchee James Bay, Quebec. Significant drill results are provided in Table 1, Figure 1 and 2. 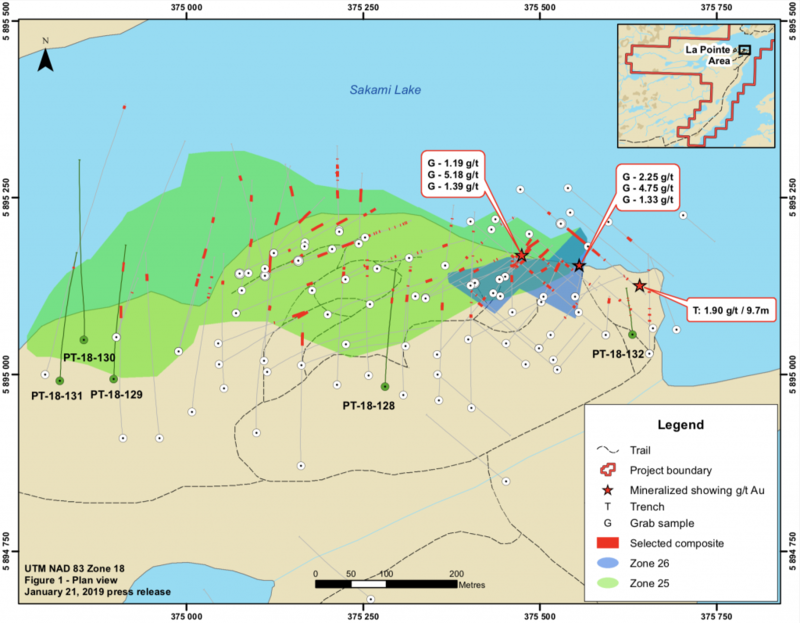 A total of 2,028 m of drilling was completed at the La Pointe area (see September 10, 2018 press release) between October and December 2018. The drill results confirm that the known gold mineralization has been extended to the west by 50 metres. The technical committee comprised of members from Goldcorp Inc. (“Goldcorp”) and QPM will be meeting this month to conduct a detailed review of the 2018 exploration results. Goldcorp and QPM will plan and approve the 2019 exploration and drilling program at Sakami. This program will benefit from Goldcorp’s technical expertise and knowledge. 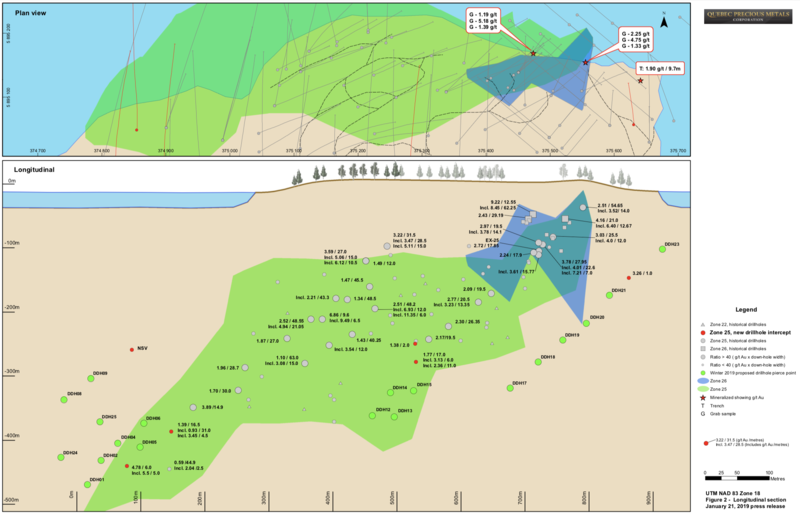 at the JR-Simon-9.6 area, located about 6 km NNE of the La Pointe area, where specific surface targets identified from previous exploration work will be tested. Intervals are presented in core length; holes are generally planned to intersect mineralization as close to perpendicular to strike as possible; true widths are estimated to range from 75% to 90% of the down-hole length when hole inclination and dip of the mineralized horizons are considered. All gold values presented are un-capped. Intercepts occur within geological confines of mineralized zones but have not been correlated to individual structures/horizons within these zones yet. Mineralization at the La Pointe area occur in two substantial gold zones (zones 25 and 26) hosted by the volcano-sedimentary Yasinski Group (La Grande Subprovince) which is metamorphosed to amphibolite facies and strongly deformed by a regional WSW to ENE event. This assemblage is composed mainly of basaltic amphibolite with local sedimentary iron formations, and is intruded by tonalite intrusions that are also highly deformed. These units are structurally superposed with a sequence mostly formed of biotite-rich paragneiss. Mineralization at the JR-Simon-9.6 area is hosted in basalts of the Yasinski Group in contact with sedimentary rocks of the Laguiche Group (Opinaca Subprovince) to the east. Quality assurance and quality control procedures were implemented to ensure best practices in sampling and analysis of the core samples. The drill core was logged and then split, with one-half sent for assay and the other retained in the core box as a witness sample. Duplicates, standards and blanks were inserted regularly into the sample stream. The samples were delivered, in secure tagged bags, directly to the ALS Minerals laboratory facility in Val-d’Or, Quebec. The samples are weighed and identified prior to sample preparation. All samples are analyzed by fire assay with AA finish on a 30 g sample (0.005-10 ppm Au), with a gravimetric finish for assays over 10 ppm Au. The field work was under the supervision of Jean-Sébastien Lavallée (OGQ #773), Vice-President Exploration, director and shareholder of the Company. Normand Champigny, Ing., Chief Executive Officer, and Jean-Sébastien Lavallée, both Qualified Persons under NI 43- 101 on standards of disclosure for mineral projects, have prepared and approved the technical content of this release.